He was born on 1945.09.18 in New York. He moved with his family to Los Angeles, and started in the music business early, landing a contract with Aladdin Records when he was 12 years old! 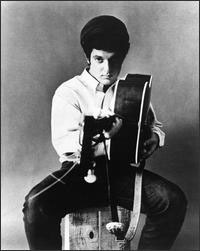 In 1963 he was teamed with Steve Lipkin (Steve Barri), and they became songwriting partners. Their first chart success came with Round Robin's single, "Kick That Little Foot, Sally Ann". They were particularly involved with the early years of the Dunhill Records label, writing, producing and performing on many of its releases. The Imperial Label, which was run by its founder Lew Chudd, was sold to Al Bennett, and it was then run as a semi-independent label.Then Al Bennett, Lou Adler, Pierre Cossette and Bobby Roberts formed Dunhill Productions. (The name "Dunhill" came from Bobby Roberts, who had been a member of a tap-dancing group called The Dunhills!) Dunhill Productions then gave birth to Dunhill Records. The quality of the releases was very high, and although not all of them were successful, most of the earliest releases are prized by collectors. Incidentally, Pierre Cossette became the executive producer of the Grammy Awards show in the 1990s. In 1965, his debut album was released, "Songs Of Our Times". Then in 1966, his second album, "12 More Times" was issued. His records had rapidly became increasingly mature, culminating in the 1967 release coupling the psychedlically-tinged "Karma (A Study of Divinations) with what many consider to be his finest song, "I Can't Help But Wonder Elizabeth". In 1967, he returned to New York, and in 1968 released the album "Measure Of Pleasure"(Atco). In 1970, "From A Distance" became a belated major hit in Japan (it is now featured on many Japanese karaoke machines! ), and he returned to California, releasing the album "Raised On Records" (Mums) in 1972. In 1985, he performed several concerts in New York, which were well-received, featuring new material. Demos were made of a number of excellent, but as yet commercially unreleased songs, such as "Rock 'n' Roll Man". In 1986, Rhino Records in the U.S.A. released a compilation "The Best Of P. F. Sloan (1965 - 1966)". Then in 1988, Big Beat in the UK released the album "P. F. Sloan / The Grass Roots". In 1990 he wrote new lyrics for "Eve Of Destruction", which Barry McGuire (photo above) re-recorded. In 1993, One Way released the CD "Anthology". In 1994, he released "Serenade Of The Seven Sisters" in Japan, and in 1997, a revised version of this work, entitled "(Still On The) Eve Of Destruction", was released in the U.S.A. He is currently working with Steve Kalinich (who co-composed with Dennis Wilson "Be Still" from the Beach Boys' "Friends" album). And he lives happily in California. Work continues on material for a future release.